Nov. 9, 2006: Conventional wisdom says the Moon is dead. Conventional wisdom may be wrong. Today in the journal Nature, a team of scientists led by Prof. Peter Schultz of Brown University announced evidence for fresh geologic activity on the Moon. 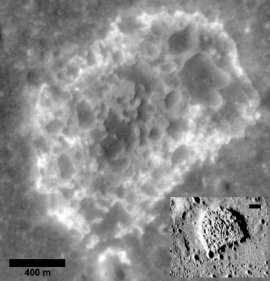 Although lunar volcanism was supposed to have ceased billions of years ago, there's at least one place on the Moon where "outgassing" may have happened within the past 10 million years--and may still be happening today (Schultz, Staid and Pieters, Nature, 444, 184). The site is a strange-looking geological feature named "Ina" in Lacus Felicitatis, a lake of ancient, hardened lava located at lunar coordinates 19o N, 5o E. "Ina was first noticed by Apollo astronauts," says Schultz. Pictured right, "it's shaped like a letter D about two kilometers wide." Ina has mysteriously sharp edges. "Something that razor sharp shouldn't stay around long. It ought to be destroyed within 50 million years," says Schultz. The destroyer of sharp edges on the Moon is a constant rain of small meteoroids that wear down mountains and craters to a nub, given time. Ina's sharp features suggest great youth. Ina is sparsely cratered. While small meteoroids sandblast the terrain into smoothness, larger meteoroids and asteroids make craters. The older the surface, the more heavily cratered it becomes. "Ina is almost devoid of craters," notes Schultz. "We found only two clear impact craters larger than 30 meters on the 8 square kilometers of the structure’s floor." Again, Ina appears young. Ina is bright and has odd colors. Rocks and dirt on the surface of the Moon grow darker as time passes. The darkening agent is space weather: a nonstop rain of cosmic rays, solar radiation and meteoroids hit the Moon and darken the ground. (The mechanisms are too detailed to discuss here, but the effect is mostly uncontroversial.) Ina, however, is bright, as if fresh dirt has been overturned and newly exposed. 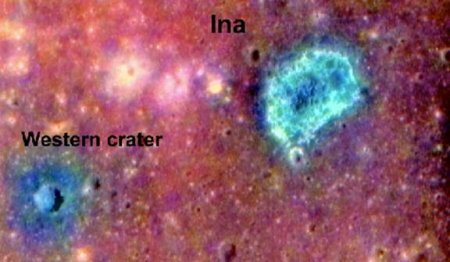 Furthermore, the colors of Ina, measured by a spectrometer on the Clementine spacecraft, are similar to the colors of the Moon's youngest craters. Yet Ina is not an impact crater. Above: A false-color composite photo of Ina and a nearby young crater. Blue denotes freshly-exposed titanium basalts, while green traces immature (relatively unweathered) soils. It all adds up to outgassing: "We believe there has been a rapid release of gasses, blowing off surface deposits and exposing less weathered materials," explains Schultz. This is not necessarily a sign of active volcanism. "The appearance of the surface at Ina does not indicate an explosive release of magma, which would create visible rays of ejecta surrounding a central crater." Instead, the gasses may have been trapped below ground for millions or billions of years and released by, say, a recent moonquake. This interpretation is appealing because Ina is located at the intersection of two linear valleys or rilles -- like many geologically active areas on Earth. "Over the years," he adds, "amateur astronomers have reported puffs or flashes of light coming from the Moon's surface." While many professional astronomers insisted the moon was inactive, the amateur sightings kept open a window of doubt. Schultz thinks it's time to start looking in earnest: "A coordinated observation campaign, including both professional and amateur astronomers, would be one way to build additional evidence for activity. A gas release itself would not be visible for more than a second or so, but the dust it kicked up might stay suspended for 30 seconds. With modern alert networks, that's long enough to move a professional telescope into position to see what's happening." There may be plenty of targets to monitor. The researchers have identified at least four features similar to Ina associated with the same system of rilles, as well as others in neighboring rille systems. Could these gases actually prove useful to future lunar explorers? Schultz thinks so. "CO2 and even H2O could be coming out of these vents. But first," he cautions, "we have to find out if the outgassing is real--and what the gases are." This makes Ina an intriguing site for future exploration by robots and people. Says Schultz, "the Moon may not be so dead after all." This research was supported by NASA. Investigators Peter Schultz and Carlé Pieters are Professors of Geological Science at Brown University. Matthew Staid is a Research Scientist at the Planetary Science Institute. The Moon has gas -- (Nature) Possible eruptions of gas confound the idea that our nearest neighbour is a geological dead zone.